There is an old myth which states that London Cab Drivers refuse to take their passengers south of the river, mainly because of this locations bad reputation. But do you know what? That's a load of b*ll*cks. If you can look past its fairly rough exterior, which you can, go on, do it, then I'd say South London is a pretty decent place to live, especially it's Eastern quarter. A quarter, I might add, that gave birth to a number of very popular celebrities. 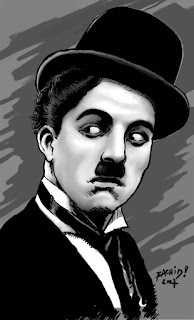 One of the most famous people to have originated from South London has to be the one and only, Charles Spencer Chaplin. Yes. His middle name's Spencer. Despite there being no official record, it is believed that Charlie boy was born in and around the East Street Market area, located within the most northerly south London borough of Walworth, near Elephant and Castle. Yes. That's correct. Frankenstein comes from Camberwell. No wonder why he always looks depressed, Ha! Seriously though, our pal Boris, real name William Henry Pratt, heralded from 36 Forest Hill Road, Honor Oak, which is just a stone's throw away from Peckham Rye Park. When he was younger, little Karloff was always teased by his schoolmates for having a darker complexion. Yet little did they know that this was because he had Indian roots, specifically from his mother's side of the family. While I'm on the subject of women, the next Camberwell celebrity I'd like to talk about is Ida Lupino. Now unlike the rest of the guys on this list, Ida came from a family full of thespians. Her mother was an actress called Connie O'Shea. Her father was a music hall entertainer named Stanley Lupino. And her uncle, Lupino Lane, both an actor and a theatre manager, eventually inspired Ida to become both an actor as well as a director. Now if you walk past the place where Charlie Chaplin was born, and turn left somewhere in between Boris's house and Claude's house, just before Ida's, you'll see a street, a very long street, which runs all the way from Walworth Road to Bermondsey. And it was here, on this very street, that a certain Maurice Joseph Micklewhite was born in 1933. Or to the likes of you and me, he's more commonly known as Alfie, Harry Palmer, that blond git with the dodgy Cockney accent and the glasses, what's his name, the governor himself, Michael Caine. Not a lot of people know that? Now if you move on in a more southerly direction the next place you'll hit after Camberwell is Bermondsey. Yes. That's right. I mentioned it before in the Michael Caine section. As it was here, in Bermondsey, sometime in 1936, England gave the world their version of Elvis Presley. We called him Tommy Steele, whilst everyone else called him that funny looking chap who sings that song. OK. I know what you're going to say. David Bowie isn't an actor, he's a singer, and the only real reason I've added him to this list is because I've already added Tommy Steele. Well, do you know what I've got to say to that, boy-oh? To that I say, but David Bowie is a real actor, despite being born in Brixton, which is next door to Camberwell and Elephant and Castle, Mister David Robert Jones (yes, that is his real name), was the first man to play the Elephant Man live on stage, plus he also starred in a lot of other movies too. Slightly further down the line from Brixton and Bermondsey is a place christened Dulwich. Now for what it's worth, I'd say Dulwich is a very up market area, made famous for its Art College, its Bell House, its pubs, as well as being the birth place for some chap who got his head kicked in by the Incredible Hulk. Yes. That's the guy. The BAFTA Nominated actor, Simon Timothy Roth. If you get on a 185 bus at Camberwell, or Dulwich if you prefer, and sit on it all the way to the very end of the line, you will come off in a place very close to me called Lewisham. Technically, Lewisham is the most southerly borough in South East London, and boarders the county of Kent with some help from a place where I live called Catford. Plus, as luck would have it, it's also here where my old mate David Jude Heyworth Law once lived. Or Jude Law for short. Now the last old-school great I'm going to add to this list is a favorite of mine, Spike Milligan. Even though he was born in Ahmednagar, India, on the 16th of April, 1918, Terrance Allan Milligan (Yes), lived a large chunk of his early years five minutes away from me in Catford, South London. It has once been said that one of the main reasons Spike ended up going a bit nutty was because of the drastic change in climate at such a young age. But as far as I'm concerned, he will always be a classic comedic great, who gave birth to the satirical movement with his fellow Goon, Peter Sellers. Now wasn't that a great list? I hope you had as much fun going through it as I did writing it. To me, no matter where you come from, South London, North London, or where ever, at the end of the day your origins may inform you, but that doesn't make you into the person you are.